The Hong Kong Polytechnic University (PolyU) will collaborate with the China Academy of Space Technology (CAST) to develop and produce a camera on the spacecraft to Mars scheduled for launch in 2020 at the earliest. The two parties signed the Collaborative Research and Development Agreement (R&DA) on Mars Exploration Project ("the Collaborative Agreement") at a ceremony today (22 August 2018). The project is in support of the nation's first Mars probe tentatively scheduled for 2020, which aims to conduct an orbital and surface exploration of Mars in a single mission, the first-ever attempt in the world. The spacecraft for the Mars probe will compose of an orbiter, a lander and a rover. Under the Collaborative Agreement, PolyU is to design and produce a camera, "Mars Landing Surveillance Camera" ("Mars Camera"), which will be located on the outside top surface of the Mars Lander. The Mars Camera will monitor the deployment status of the Mars Rover with respect to the status of the solar panel, antenna, as well as the rover's movement. The information is critical for the successful movement of the Mars Rover onto the Mars surface. Chairman of the PolyU Council, Mr T C CHAN, said at his welcome remarks, "PolyU is the only tertiary education institution in Hong Kong with experience in space missions. Our researchers have been involved in a number of national and international space exploration projects since the 1990s. It is our pleasure to work with CAST again to advance space technology and research through the joint development of Mars Landing Surveillance Camera, and support the nation's Mars Exploration Programme. 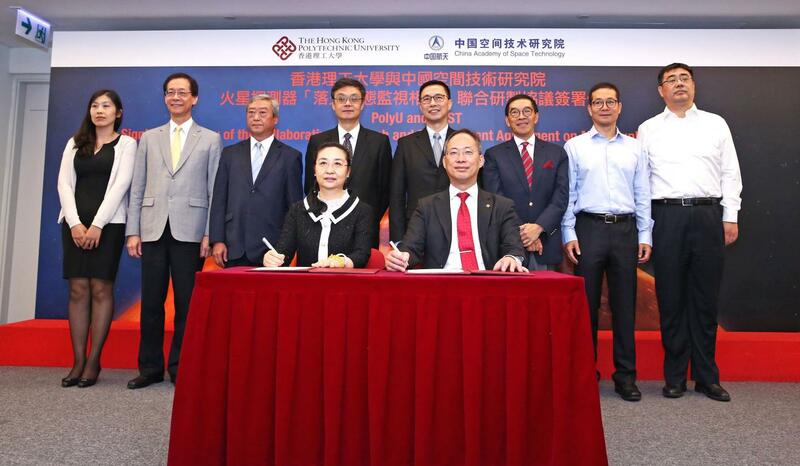 We are keen to capitalise PolyU's expertise to further contribute to the development of the nation's space industry." The Mars Camera will have to be light in weight (around 380 grammes) while strong and durable under extreme temperatures during the extended period of space travelling between Earth and Mars (over nine months), followed by operation under extremely low temperature on the Mars surface. It will also be able to tolerate impact shock of 6,200G (i.e. 6,200 times of the force of earth's gravity). Despite having a wide angle field of view (a maximum of 120 degrees horizontally and a maximum of 120 degrees vertically), the Mars Camera will have low image distortion. Professor YUNG said, "Among all the difficulties in the research and development (R&D) work, the two biggest challenges are the wide field of view with low distortion optics under high impact force with little available mass, and the high reliability required under a prolong period of extreme temperatures, radiation, mechanical vibration, etc." PolyU has been actively participating in space exploration projects through designing and manufacturing sophisticated space tools in the past decade. These include the "Mars Rock Corer" for the European Space Agency's 2003 Mars Express Mission, the "Soil Preparation System" for the Sino-Russian Space Mission in 2011. Being the only tertiary institution in Hong Kong that possesses international space qualification experiences, PolyU has been contributing unreservedly to the nation's space projects since the longstanding partnership between PolyU and CAST began in 2010. The two parties signed a pact for the establishment of a Joint Laboratory in Precision Engineering for Space Applications, and CAST donated advanced space research equipment to the Joint Laboratory. In the nation's lunar exploration programme, Professor YUNG collaborated with the mainland experts to develop a "Camera Pointing System" for Chang'e 3 and Chang'e 4, and then the "Surface Sampling and Packing System" for Chang'e 5 and Chang'e 6.